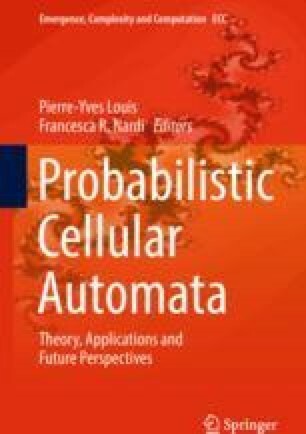 Many probabilistic cellular automata (PCA) exhibit a transition from an ergodic to a non-ergodic regime. Namely, if the free parameter is above a certain critical threshold, the process converges to a state that does not depend on the initial state (ergodicity), whereas if the free parameter is below the threshold, then the process converges to a state that depends on the initial state (non-ergodicity). If one considers the corresponding model on a finite space, such a transition is not observed (the process is always ergodic), nevertheless the convergence time is “small” when the corresponding process on infinite space is ergodic and “large” when the corresponding process on infinite space is non-ergodic. We analyse this correspondence for Percolation PCA, a class of probabilistic cellular automata which are closely related to oriented percolation.